In an attempt to destroy the Locust and their home, the Hollow, the COG flooded their final stronghold. The once glorious and illustrious city of Jacinto sank beneath the waves and took the Hollow with it. The survivors took to the seas, traveling between safe refuges only to be quickly driven out by the Locusts. I’d like to assume that those traveling by sea managed to catch some fish and turn them into a big stew. Fortunately, this ordeal happened on Sera and not Earth. No need to worry about scary old Locusts and Lambents here! On Earth, I can pleasantly sit in front of my Xbox and enjoy playing Gears of War while nibbling on some cioppino. Hopefully, no one will find an extremely viscous form of fuel that subsequently turns all those who are exposed to it into gigantic walking bombs. If that happens, I hope science is already has a working Hammer of Dawn ready to go. Take that, Locusts! Since I’ve lived near San Francisco for a fair amount of my life, I’ve grown to enjoy the wonders of living near a gigantic ocean. 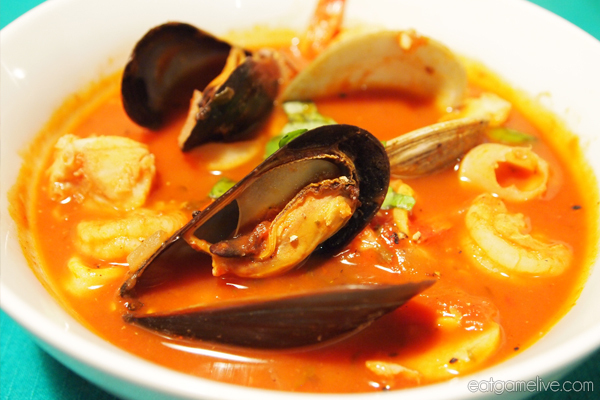 More specifically: the seafood.To take advantage of all the delicious seafood in the area, I’ve decided to craft this San Francisco treat: cioppino! And since this stew is incredibly red and Gears of War is a pretty brutally bloody game, maybe it’s fitting? Or maybe I just like Gears of War too much… Hmm… I wonder of the citizens of Jacinto managed to snag any delicious seafood before their city sank. Because I love cioppino so much, I decided to make a big batch. These are the ingredients I used to make a gigantic batch (about 6 servings), but if you’d like to make a smaller batch, please half the ingredient amounts and should end up with a smaller, more manageable batch. Additionally, you can add (or substitute) in scallops and crab. You will need a large pot for this dish. Prep time will be about 15 minutes. Total cook time will be about 30 – 45 minutes. This recipe makes about 6 servings. Set a large pot on high heat. Add in your oil. When the pot becomes hot, add in your diced onions and minced garlic. Saute until your onions become slightly translucent. Add in your tomato paste and stir. Add in your whole peeled tomatoes. Crush the tomatoes with a large spoon or spatula. You do not need to crush them into fine bits; you just want to break the tomatoes open. Add in your chicken broth and white wine. Add in your salt and pepper to taste. Add in your bay leaves and stir. Add in all of your seafood. Be sure to stir the cioppino after each batch. Cover the pot with a lid and cook for about 25 minutes, stirring occasionally. Your cioppino will be done once all of the mussels and clams open. Remove bay leaves and any mussels or clams that did not open. Ladle cioppino into a bowl. Sprinkle chopped basil over the cioppino. 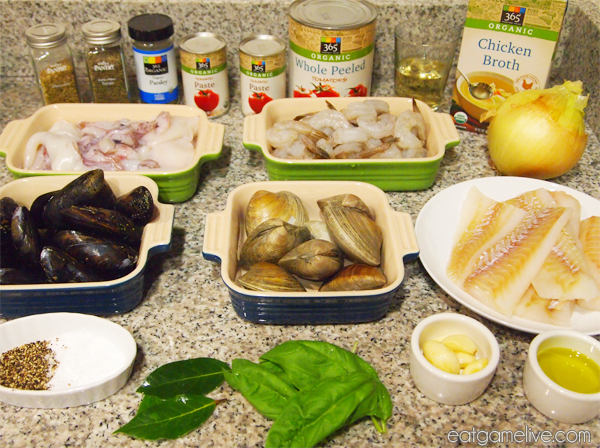 And that’s all you need to do to create Jacinto seafood stew. GG WP! If you’d like a little starch with your meal, I suggest getting some nice crispy bread. Sliced baguettes would be an awesome application. 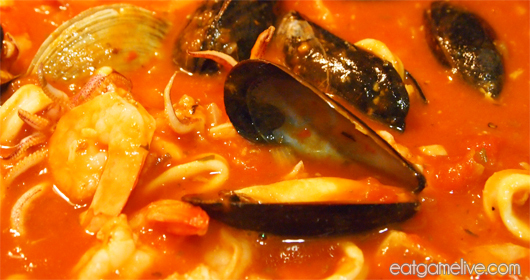 I’ve also seen cioppino served over spaghetti much like seafood marinara. Whether you add a bready accessory or go au naturale, this cioppino will certainly be delicious. Om nom nom nom. Now go power up those Lancers and get cooking in the kitchen! 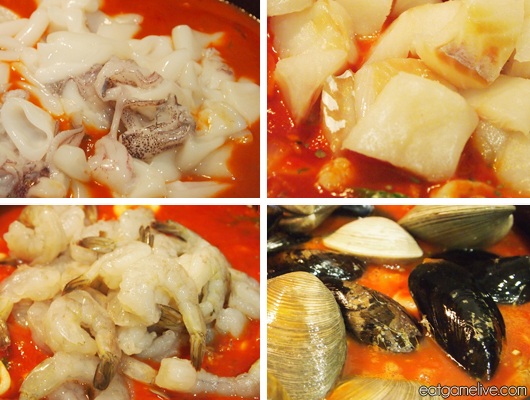 This entry was posted in gears of war, seafood, soup by admin. Bookmark the permalink. This looks…. seriously fantastic. I’ve never heard of it.. but I’ve found my next date night meal! Awesome 😀 Hope it turns out well for you! Generally I don’t read article on blogs, however I would like to say that this write-up very compelled me to take a look at and do it!